Posted in Blog, Exchange 2007, Exchange 2010 at August 27th, 2010. No Comments. Problem 1: When logging on to a Windows 2008 R2 Remote Desktop Services (former known as Terminal Services) you get the a balloon messages saying a temporary profile is loaded. Changes to the profile are not saved by exiting. Then start the registry editor and browse to HKEY_LOCAL_MACHINE \ SOFTWARE \ Microsoft \ Windows NT \ CurrentVersion \ ProfileList here you will find all user SID’s logged on to this RDS server. You will find here a subkey know as SID.bak take a look probably this will be the key of the user you get this error. Delete this key and close registry editor (If you are not sure, first make a backup/export of the key before deleteing is). Then logoff and logon again. Problem 2: When you try to logon to a Windows 2008 R2 Remote Desktop Services (former known as Terminal Services) server, you get the error: “The Group Policy Client service failed the logon.” “Access is denied.” and you are automatically logged off. Solution: In my case this problem was caused by a corrupted NTUSER.Dat file. I solved it by logging on as a Administrator changed the user profile to local via Control Panel\User Accounts\User Accounts Configure advanced user profile properties. Then I replaced the NTUSER.Dat from the user by the NTUSER.Dat from the temp profile. Probably this is caused by using a Terminal Server profile that is corrupted. Another Solution could be deleting this profile and building a new profiles for this user. Posted in Blog, Windows 2008R2 at August 25th, 2010. 9 Comments. After someone (accidentally) deleted a exchange public folder in a exchange 2010 organization, you can easy recover the deleted folder using ExFolders. ExFolders is the exchange 2010 replacement of the PFDAVAdmin tool. ExFolders must be run on a exchange 2010 server and it can connect to Exchange 2007 or 2010. Download the Exchange 2010 RTM ExFolders tool here and the Exchange 2010 SP1 version here. 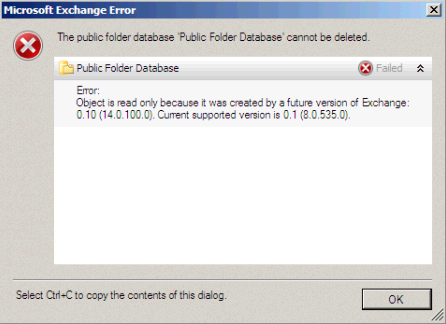 To recover a exchange 2007 or 2010 public folder start the ExFolders tool. Choose file – Connect and select a Global Catalog and the public folder database where the deleted public folder was on. After that you will see the deleted public folders in red. Select the concerning folder, right click and choose “Recover folder”. Recovery starts now just wait depends on the size of the public folder it can take a while. Posted in Blog, Exchange 2007, Exchange 2010 at August 20th, 2010. 29 Comments. We were migrating a SBS 2003 server to a new SBS 2008 server via the swing migration method. After turning on the SBS 2008 server and temporary dc / exchange 2003 server we were not able to access or move the exchange 2003 mailboxes. The mailbox move gives a: “The move-mailbox task for mailbox ‘mailboxname’ failed. Error: Failed to open mailbox with error: The operation failed.” error on the SBS 2008 (Exchange 2007) server. On the Exchange 2003 server we get a: Event id 1022: “Logon Failure on database “First Storage Group\Mailbox Store” – Windows account domain\accountname; mailbox /o=domain/ou=first administrative group/cn=Recipients/cn=accountname.Error: 1144″ error. Solution: It looks like that after forklift and update a exchange 2003 database it could take some time to connect because AD has to replicate the information between the 2 domain controllers. When this is done everything works fine. This can also occur after moving the exchange mailboxes to a the new sbs 2008 / exchange 2007 server. Posted in Blog, Exchange 2007, SBS 2008 at August 17th, 2010. No Comments. Solution: Add the “Exchange Trusted Subsystem” security group to the local administrator group on all the Exchange servers. Posted in Blog, Exchange 2010 at August 13th, 2010. 2 Comments. Everytime you restart a Small Business Server 2008 the default gateway disappears. Solution: When you take a look at the following registry key: HKLM/System/CurrentControlSet/Services/Tcpip/Parameters/Interfaces/ CLSID of the network card this is happening for, you’ll probably notice it by viewing the ipaddress value. Then open the “DefaultGateway” value. In our case you see the default gateway but above it there is an empty line. After removing the empty line, restarting works fine and the problem didn’t occur anymore. Posted in Blog, SBS 2008 at August 8th, 2010. 2 Comments.